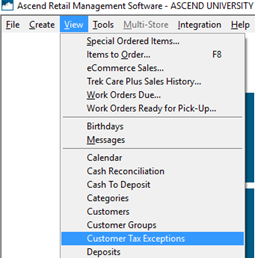 From the Ascend Desktop, select the View menu > Customer Tax Exceptions. On the toolbar, click Add. In the Description field, enter a meaningful explanation of the exception reason (e.g. Non-profit agency). Check Requires Tax ID if a tax ID must be provided. Leave Hidden unchecked to activate the exception reason.